A pax (from the Latin for ‘peace’) symbolised the kiss of peace shared by early Christians. It was passed around and kissed during the Mass, but the Anglican church abandoned the practice at the Reformation. This example comes from the period when English Catholics had to worship in secret. It is engraved with the Crucifixion, along with ‘INRI’ for ‘Jesus of Nazareth, King of the Jews’ and ‘Pax tecum’ for ‘Peace be with you’. 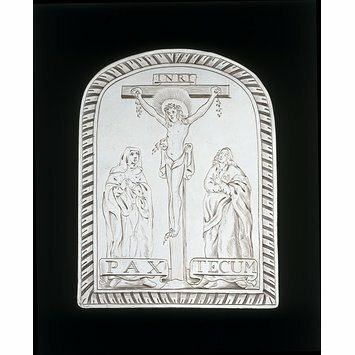 The shaped silver plate is engraved with the Crucifixion, flanked by the Virgin and Mary Magdalene. On the reverse is a double scroll handle cut from sheet silver. This pax was made for use at mass in the private chapel of a recusant (Roman Catholic) chapel. It was passed among the congregation to be kissed. In Catholic churches, the pax was passed around the congregation to be kissed during the Mass. The English church abandoned this practice at the Reformation. 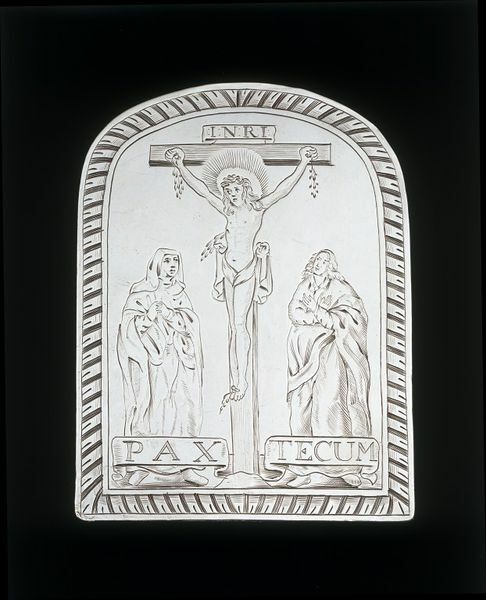 This pax is engraved with the Crucifixion, along with 'INRI' for 'Jesus Nazareth King of the Jews' and 'PAX TECUM' for 'Peace be with you'. Historical significance: This pax engraved with the Crucifixion, flanked by the Virgin and Mary Magdalene, has a scrolling handle so it can be passed from one member of the congregation to another. The Crucifixion is an image which is most often found on paxes. In England, the use of the pax lapsed at the Reformation but continued in recusant circles. This example would have been made to order. After the Reformation, the Roman Catholic faith was severely restricted. Catholics who refused to attend Church of England services were known as recusants and until the late 17th century they had to worship in secret. However, the Dukes of Norfolk and aristocratic families such as the Arundells at Wardour Castle encouraged Catholic communities to use their private chapels and so kept the faith alive. The Catholic plate that survives from before the 1660s is mainly limited to chalices, paxes and pyxes. These earlier pieces are rarely marked. After 1688, Catholic plate was more often hallmarked and the range of forms expanded to include sanctuary lamps, cruets and incense boats. In London, Catholics could worship openly in foreign embassy chapels. The silver from the Sardinian Embassy chapel can be seen in the case to the right. During the reign of Charles II, Catholic courtiers could also attend the queen's private chapel and that of the Queen Mother, Henrietta Maria.